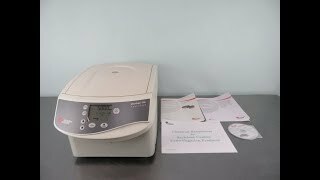 The Beckman Microfuge 20R Refrigerated Centrifuge is a powerful, high speed, flexible, compact solution for your lab with temperature control for your sensitive samples. Labs can quickly process their applications such as purifications, concentrations, phase separations, receptor bindings, rapid sedimentation of protein participates, nucleic acid and protein preparations, pelleting, and extractions. The Beckman Microfuge 20R speeds top out at 15000 rpm with a maximum RCF of 20627 x g. This Benchtop Micro Centrifuge has a maximum capacity of 48 ml, held in the 24-place fixed angle rotor with biocontainment shield. Uses can save time and effort with programmable protocols, and intuitive user interface displays. This microcentrifuge has a temperature range of between -10 and 40°C, that can be set in 1-degree increments through the upfront digital interface. The microprocessor control of this Beckman Centrifuge will store up to 10 user defined programs, and has both fast or soft acceleration and deceleration profiles to suit your needs. This Beckman Coulter Microfuge 20R Refrigerated Centrifuge is brand new in the box. This unit has been tested to assure performance to factory specifications. All of our lab equpment comes back with our standard warranty. Should you have any questions, please don't hesitate to contact us.